The Limited Edition Fender American Professional Mahogany Telecaster Deluxe ShawBucker is crafted from Honduran mahogany that fell during hurricane Mitch in 1998. You'll notice a warmer tone with plenty of sustain. Tim Shaw designed the two ShawBucker humbucking pickups for a vintage voice that still offers plenty of punch. And Fender's popular neck carve has been enhanced to a Deep-C profile that fits your hand comfortably. This limited mahogany Tele Deluxe has all the elements that make Fender guitars legendary — and much more. What sets this limited-edition Tele Deluxe apart from other instruments in Fender's American Professional line is its warm sounding and looking Honduran mahogany body. But this is no ordinary mahogany. The tree this wood was cut from fell during hurricane Mitch in 1998. It has been naturally drying and curing since that time. Not only does this offer the rich tones and hues that Honduran mahogany is known for, but you'll enjoy the peace of mind that comes with responsibly sourced and reclaimed tonewood. A great set of vintage Fender humbucking pickups should be warm sounding, clear enough to enhance your playing nuance, and able to get gritty and aggressive when needed. Pickup guru Tim Shaw designed this set of ShawBucker humbuckers to do just that. But unlike vintage pickups, the ShawBuckers feature a touch more punch and are balanced between the two pickups. This means you'll enjoy consistent output across all three pickup positions. And the onboard treble bleed circuit ensures your tone stays clear and present when lowering the guitar's volume. The Deep-C neck profile that you'll find on the Fender American Professional Telecaster Deluxe ShawBucker solidbody electric guitar is a slight upgrade from the Fender American neck players have been in love with for years. By adding a touch more roundness to the back, the Deep-C carve fills your hand perfectly while never inhibiting your technique. And your fingers will immediately notice how much control they have on the fretboard's narrow-tall frets. For good reason, this fret wire is the most requested size at the Fender Custom Shop. 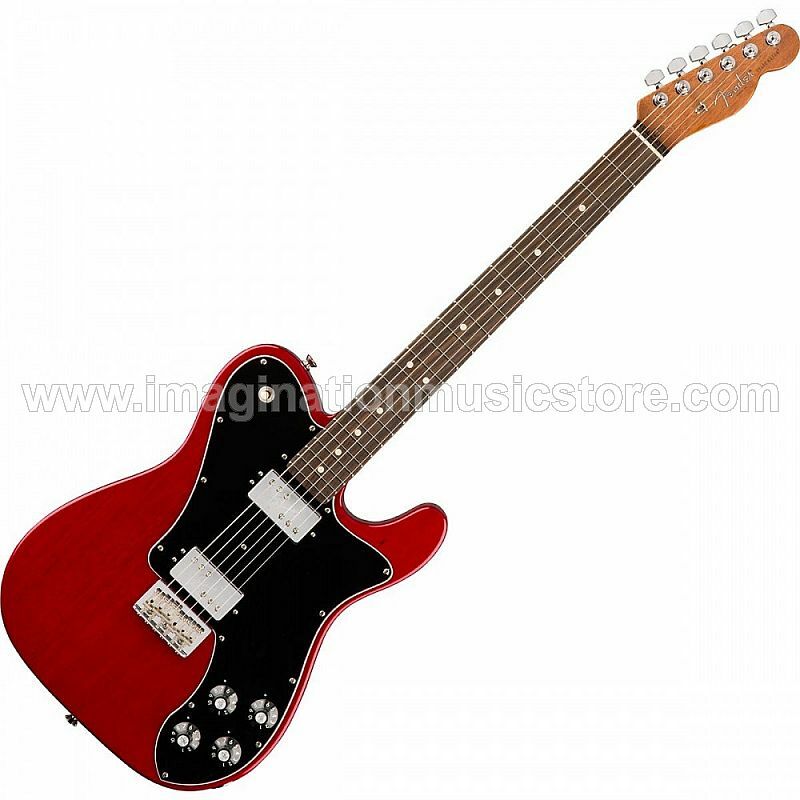 The Limited Edition American Professional Mahogany Telecaster Deluxe ShawBucker solidbody electric guitar features an old-school 6-saddle hardtail bridge. Each saddle is crafted from bent steel for an authentically vintage tone. Each saddle can also be adjusted for string height and intonation, ensuring your American Professional Telecaster Deluxe ShawBucker plays in tune all the way up and down the fretboard.